George Graham Reviews Jonatha Brooke's "Live"
Live albums are not quite as common as they used to be. There was a time when an in-concert recording was nearly obligatory for most rock bands after reaching a certain level of popularity. It gave the band's fans a chance to hear the group in performance, which was good for both those who had been to the shows and those who never got the see the group play live. It was a relatively easy and inexpensive way for a record company to release more music by a popular group, and for the group to make another record without having to write new material. Live albums have ranged from the definitive recordings for some artists, to embarrassments for others. With the high turnover rate of artists on the major-label pop scene, in which the record companies quickly drop artists if they don't go platinum on their first or second release, not a lot of artists on major labels are getting to the stage of putting out live albums. This week we have a delightful live recording from an artist who has reached the point in her career where a concert recording would be appreciated by her fans. But, typical of the state of the music industry, she was dropped by the major label for which she had recorded. So she released the album herself on her own label. It's simply called Jonatha Brooke Live. Jonatha Brooke came to public attention as the songwriting half of the much-acclaimed Boston-area folk duo called The Story. After releasing a debut album in 1991 on the folk and Celtic-oriented label Green Linnet Records, the group was picked up by Elektra, which re-released Grace in Gravity and issued their 1993 follow-up, The Angel in the House. Then a year or so later, Ms. Brooke and Jennifer Kimball went their separate ways, and in 1995 Ms. Brooke released a solo album called Plumb under the name "Jonatha Brooke and the Story," which featured similarly high-quality songwriting and vocal work that marked The Story, though without original duo's distinctive two-part harmonies. Ms. Brooke's next solo album was called Ten Cent Wings, and got a fair amount of critical notice, but as a sophisticated and thoughtful record, it sold nowhere near the millions of pop stars like Jewel or Fiona Apple, so Ms. Brooke was dropped by MCA Records. But like many of the bright lights on the folk scene, she had developed a considerable fan base through frequent touring, mailing lists and a presence on the Internet. That led her to decide to release her next album independently. She originally intended to do a set for her fans that contained both new songs and versions of previous material she felt would more accurately reflects the way she was doing the songs in performance. So she took some recording gear on the road, and ended up with enough first-rate material that the project became an all-live CD, comprised of performances of previously recorded songs, in the manner of a classic pop-star live album. While Jonatha Brooke Live will probably find its most receptive audience from among the artist's existing fan base, it's also an excellent album to help introduce more listeners to this articulate, poetic songwriter with a beautifully clear voice. The CD contains a collection of songs that span both of The Story albums and her two previous solo recordings, given rather different treatments, ranging from a stark solo performance to tracks with a whole band. She is joined by various supporting musicians, depending on from which tour stop the recording came, and include her current regular trio with Ingrid Graudins on keyboards and harmony vocals, and Nick D'Virgilio on bass, percussion and some backing vocals. Among the guests are jazz drummer Brian Blade, and guitarists Gerry Leonard and Duke Levine. One of the common dilemmas with music from a sophisticated singer-songwriter like Jonatha Brooke is that there is the temptation in making studio albums to add additional instrumentation and production, and that, ironically, often makes the songs themselves a more difficult to appreciate as compositions. The more scaled-back live settings of her songs on this CD give the listener a better appreciation of Ms. Brooke as a writer, and as a singer who can pull off her memorable vocals as well on a stage as in the studio, where one can have as many retakes required for perfection. In that respect, the album is also impressive. I read the other day that the new Alanis Morrissette album is considered a disappointment since it sold only four million copies. It's little wonder that an artists as intelligent and subtle as Jonatha Brooke was dropped by the major label that had rather surprisingly signed her in the first place. Now she has gone the independent route to release Jonatha Brooke Live. Freed from commercial constraints like pressure for too much instrumentation, a heavy beat, and bad sound, Ms. Brooke was able to re-examine some of the songs from her eight-year recording career, and provide to her fans honest, spirited performances of her subtle, multifaceted songs. In most cases, the interpretations on this live album are more appealing than the originals. Perhaps because she was in front of an audience trying to reach them in person, the songs take on added life and draw the listener into both the lyrics and the tasteful musical settings. 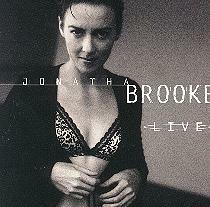 Although the first Story album was nothing short of amazing, Jonatha Brooke Live comes close. In terms of sound quality, the album is first-rate. Ms. Brooke uses an amplified acoustic guitar the output of which is the guitar sound heard, rather than having the richer sound of the actual acoustic instrument with good microphones in front of it, but it's still a pleasing sound. Ms. Brooke's vocals are outstanding, and the overall mix is excellent, especially for a live album. The only quibble is that the audience seems a little distant. The dynamic range of the recording is also quite commendable. While Jonatha Brooke Live is mainly aimed at her existing fan base, and is primarily being made available through her website, those who have not yet heard this extraordinary singer-songwriter will be in for a treat on this beautiful album.